The SHOWCASED HIGHLIGHTS section is intended to briefly showcase photos devoted to a specific tool or group of tools and/or photos related to the recent exhibits. The accompanying photographs and descriptions are intended to expand the scope of awareness related to each topic without going into a extended degree of detail. What are now commonly recognized as traditional fire axes started to be offered by axe manufacturers toward the end of the 1800s. Numerous manufacturers provided such axes and most looked strikingly similar to the others. In reality there were numerous weights and sizes made buy most makers. Most makers also included minor variations in shape. Basically there were three sizes, Full, Truckman’s, and Belt (hatchet). Some excluded the spike and had extra wide, heavy flattened polls for bashing through locking devices and/or next to door hinges. The example at the lower right is an English design. The older Victorian style axes were made in a variety of shapes and ranged from plain to ornate. Some were painted in red and/or gold combinations and some included symbols. A number were actually made more for ceremonial purposes such as parades but most were quite functional. The eyes in the two at the left go completely through, the other has a socket with screw. Various tools, some combining the axe with another type of implement, were considered fire fighting tools. They were frequently used to fight outdoor fires involving the need to clear away vegetation. 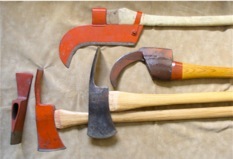 Those at the upper right are forms of brush axes. Those at the lower left are called Pulaski Tools, named after the original inventor. Examples of paint schemes that were used on various fire axes. Many local fire brigades had customized designs. FIRE AXES: Remembered by many of the older generation, fire axes at one time were much more commonly seen than now-a-days. Practically every public building (even schools), theaters, railroad cars, ferries and other vessels that carried a group of people had one or more fire axes readily available in case of an emergency. The spiked-style as well as the single bit style of fire axe is still rather common on certain marine vessels and of course on most fire trucks. The older style, sometimes referred to as a “battle axe” or “Victorian style”, are still occasionally seen in parades or on display in museums. There are also a number of similar other style tools that are sometimes referred to as fire axes that are actually used as fire fighting tools. Some are still quite common in areas susceptible to forest or grass-land fires. Contemporary fire fighting tools have taken on a whole new appearance and are multi-functional with most including an axe-like component. 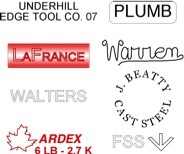 A sampling of stampings and paper labels that were used on various fire axes manufactured between 1900 and 1975. 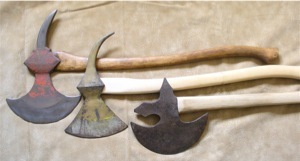 The label at the right was used on some English fire axes. RED AXES: Most old axes encountered today appear to be black (oxidized and rusted not withstanding) and originally many were actually painted black or achieved that coloring as a result of other processing. The second most popular color was red, ranging from deep red to vermilion (axe at far left) with many shades in between. 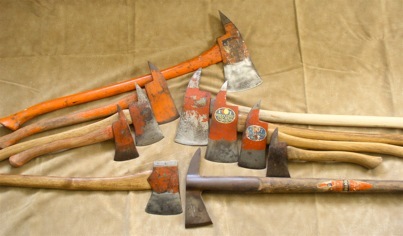 A close look at many old and collectible axes shows various degrees of red paint, sometimes in small amounts down in crevices or around the eye. Some have even withstood the test of time with vestiges of their original labels included. Contemporary label facsimiles are included to show approximately how they may have originally looked. Of course some axes also had lettering stamped into the head. Depending on the circumstances, that lettering may have been the full or abbreviated name of the maker or distributor. The marking on the right is stamped into the hatchet head and stood for King Axe & Tool Co.
Facsimiles of the paper labels that were used on the axes depicted. The most common appearance of early axes was that they appeared black. That was because they had been subjected to the extreme heat of the forge and then rapidly cooled with the resulting surface becoming black in appearance. That black appearance endured providing the axe was not scratched or exposed to certain conditions such as excessive moisture of corrosive chemicals. With a little care the scratches would usually turn blackish again. That was because of the makeup of the metal. Nowadays that overall dark appearance is referred to as a natural patina. Initially it was an oxide that affected the original surface. It was not normally rust as we experience today. The composition of the metal was a determining factor. As the metal used for axes was modified to make it more useful for an axe it was more prone to rust so larger makers coated the metal to protect it and make each item more uniform in appearance. One of the primary materials used for coating was a type of oil-based varnish with lamp-black added. Of course other coatings were used but the black coating provided a coating that hid minor discoloration as well as protected the surface from normal moisture exposure. That coating eventually became commonly known as paint. It is surmised that some early manufacturer found that on occasion a coating of red paint did the same while adding two other attributes; it was more eye catching and it made the axe stand out from that of competitors. The red coloring was obtained from vermilion (the natural form is a mineral called cinnabar). Vermilion is more orange (Chinese red) than what is commonly considered red today but it was mixed with something else to make it more of a scarlet red. That raised the question; was the material used ferrous oxide and was it obtained from the grinding of axe heads? If the rational for using red was as surmised it did not remain unique to one maker for very long and soon many makers were using a red coating. The original time frame for the introduction of paint coating on axes is the last quarter of the 1800s. The next color that was introduced as an axe color was blue. It was usually used in specific areas on an axe head such as the “bevels” on W. C. Kelly axes. Along with the use of blue, axe makers introduced the use of bronzing paints, which in the late 1800s were made to look like gold. Bronzing paints were made by mixing extremely finely ground bronze, brass, copper and sometimes zinc into a clear varnish. They retained their luster for some time as long as the clear varnish protected the metal particles. Silver paint was obtained from mixing ground aluminum into the varnish but that did not become economically practical until the beginning of the 1900s. To a much lesser degree other colors were also applied to axes. It is believed that was more as a feature used to distinguish one brand or brands offered by certain wholesalers from those made by others. Another reason was to identify axes belonging to major users who bought in bulk. A specific color was less prone to be pilfered. That of course was not the only reason. Marking schemes were rapidly emerging and color played a major role in many of those schemes. Another consideration was that paper labels stood out and appeared quite differently on an axe painted a color rather than black. Many advertisements showed the label on a painted axe head but viewing the label without a colorful background diminished the visual impact significantly. All things considered, the three most commonly used colors in order of popularity were Black, Red and Blue. Yellow, Green and Orange were available from some makers, usually by request. The Mann Edge Tool Company did use yellow on some axe heads as a stock color but that was quite limited. Dark green has been seen occasionally but enough to suggest it was a stock color for some axes by a company that did not include any permanent markings. Orange was used for high visibility (even today); gray by the Navy and Coast Guard and Military Green by the Army and Marines. A brown finish was obtained from a chemical process much like the Sager process that resulted in a blued finish. The description or naming of colors was not complex in the late 1800s and early 1900s. The name was often prefaced by words like light, medium and dark and/or glossy, bright or dull. Sometimes a color name was a combination of color names such as red-orange. Whatever the name, colors requested that were other than black or red usually resulted in a slightly higher price unless the order was very large.